You’ve decided a nursing home or assisted living is not for you, at least not yet. Is your home aging-in-place ready? Some things likely need to be done to ensure you can safely remain in your home for as long as possible. This aging in place remodeling checklist will help you get your home prepared so you don’t have to worry about renovations down the road. To help you keep things organized, we’ve broken this checklist down in two ways. First is by area of the home. Second is by special concerns such as safety that may apply to multiple areas of the home. Also, some of the items we’ve included do not require a contractor. For example, guide lighting in hallways may be as simple as a few nightlights and removing throw rugs is simple. However, because falls are always a concern for seniors, these things are vital when aging in place, so we have included them. 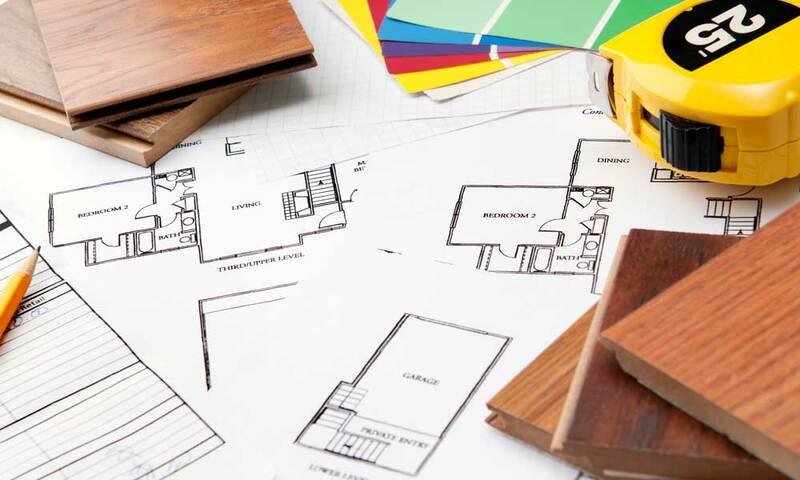 For things that require contractors, remember that if you have a VA home loan, or are otherwise qualified, there are VA programs that can help with remodeling costs for seniors and those living with a disability. ✓ Repairs – Any roof damage, damaged weatherproofing, rotten deck or steps, door seals, etc. should be repaired. ✓ Low maintenance landscaping – Consider replacing high maintenance flowerbeds and temperamental grasses with hardier and slower growing grasses without a lot of lawn decoration to hamper mowing. ✓ Limited mobility entrances – Decks, patios, porches, and approaches to doorways should be wide enough to allow a walker, mobility scooter or wheelchair to pass easily. Stairs should be replaced in favor of gently sloping ramps with handrails or guardrails. These areas should also be a non-slip surface and covered if possible. Door thresholds should not have a sudden lip or drop in height that could cause stumbling or be difficult for a wheelchair to cross. ✓ Doorways – All doorways should be wide enough to comfortably admit a walker, mobility scooter, or wheelchair to pass through and thresholds should be flush or gently beveled for easy transition between rooms. The Americans with Disabilities Act (ADA) recommends a minimum doorway width of 36 inches. Widening doorways may require a contractor. ✓ Door hardware – Replace knobs/handles with lever-type handles. These require less grip, which is good for those with arthritis or grip issues. ✓ Windows – Windows should be weather sealed against drafts and high insulation windows installed if possible. ✓ Curtains – Any curtains or blinds should have hardware installed for easy closure and opening from a seated position if needed. ✓ Locks – Window locks should be updated for safety and ease of use. ✓ Hallways – Should be wide enough for a walker, mobility scooter, or wheelchair to easily pass. The ADA recommends a minimum hallway width of 48 inches. Widening hallways may require a contractor. ✓ Counter height – Counter heights may need adjusting to accommodate working from a seated position. The ADA recommends a minimum countertop height of 36 inches. ✓ Sinks – Sinks may need under-counter clearance for a wheelchair. ✓ Water – Safety controls on water heaters to prevent scalding. ✓ Storage – Additional lower storage shelving should be installed to prevent falls from reaching for items in high storage or items in high storage falling on you. ✓ Freezer – A side-by-side or all-in-one refrigerator/freezer unit can make reaching foods easier. ✓ Stove – An electric cooktop with controls on the side or front can be safer than a gas stove or controls on the back. ✓ Tub and shower – Make sure your tub/shower is accessible. This may mean a roll-in shower or a walk-in tub and shower combination that reduces the need to step up and over the side of a bathtub. ✓ Handrails – Should be installed near toilets and tub/shower entrances. ✓ Non-slip flooring – Should be installed for wet areas. This can mean non-slip mats or painting hard bathroom surfaces with non-slip paint. ✓ Taller toilet – Toilet seat risers are an easy DIY fix. ✓ Safety controls– Anti-scalding valves on water heaters or bathtub faucets prevent scalding. ✓ Guide lighting – Lighting designed to activate in case of a loss of power should be available in all rooms. ✓ Hallway lighting – Hallways should have nighttime guide lighting for safety of movement. ✓ Lighting controls – Lighting controls should be easily accessible from a seated position height. ✓ Updating– Old wiring should be inspected and brought up to code. ✓ Outlets – Any worn outlets should be replaced and ground fault-interrupt safety plugs installed. ✓ Capacity – Many older homes have wiring systems, breaker boxes, and main electrical boxes that are not designed to handle the amount of power currently used by modern appliances and electronics. Older homes may only have a capacity around 100 AMPs and this might not even comfortably power a modern kitchen. The capacity of your home should be updated, which may mean replacing the main electrical box and breakers, to handle not only your current needs but also to be able to handle medical equipment and assistive devices you may need in the future. ✓ Backup – Because you may come to rely on certain medical devices such as oxygen, consider having a backup generator system or other backup power option installed in case of power outage. ✓ Cords– Any power cords should be neatly bundled and secured so they can’t be a tripping hazard. ✓ Extension cords and multiple plug adapters – A special note on extension cords and multiple plug outlet adapters. Overloading power outlets is not only a fall hazard, it is the cause of 12 percent of electrical house fires each year. Have extra outlets added when updating your home’s wiring instead of relying on power strips, extension cords, and overloading outlets. ✓ Alarm system – Burglar, fire, CO2, and any other alarm systems should be updated and placed where batteries can easily be changed and maintained without climbing ladders or arrangements made for help in maintaining the systems. ✓ Escape route – In case of fire, climbing out a window may be difficult as you get older. In fact, by age 65, seniors are twice as likely to be killed or injured in a fire as the rest of the population. Consider an easier escape route than a ladder such as an inflatable slide which can be installed underneath your window on the exterior of your house and activated with a lever. ✓ Peepholes – Door security peepholes should be lowered for easy access from a seated position or replaced with a video system. ✓ Handrails – Secure handrails should be added along the stairwell. ✓ Non-slip surface– Stair surfaces should be non-slip. Adding grippy, stick-on traction pads is an inexpensive way to give you traction on stairs. ✓ Lips – Some styles of stair have a lip where the stair top extends over the stair riser. These are notorious for causing trips and falls. Any stair lips should be eliminated. ✓ Alternatives – If possible, a stair lift or a residential elevator can be installed to eliminate the need to use the stairs. ✓ Non-slip surface – Some flooring surfaces are more slick than others. Consider flooring that is less likely to be slippery such as lightly textured carpet or add anti-slip paint to hard surfaces. ✓ Throw rugs – The edges of throw rugs can easily cause trips and falls and should be removed. Throw rugs are one of the two major home hazard categories recognized by the CDC for common fall causation. ✓ Clear space – When arranging furniture and belongings it is vital that you keep floor space clear as much as possible. Wider paths for moving throughout the home accommodate walkers, mobility scooters, and wheelchairs while also helping to prevent falls from trying to move in a cluttered environment. A professional organizer can be a big help in getting your living space free of clutter.